The ratio of your photo can affect its composition and how it looks on your wall. We’ll walk you through everything to consider as you decide on the right ration for the print you want to hang in your home. To choose the right size for your photo print, you need to consider the ratio of your photo and the ratio of the print you want to hang. You don’t want to accidentally select a ratio that will require cropping from the sides of your perfect photo! The photo’s ratio is the relationship between the width and height of your image, which is numerically expressed with two numbers, for example a ratio of 3:2. The number in front of the colon is the width of the photo and the number after the colon is the height of the photo. The most common image ratios are 3:2 (or 2:3 if hung vertically) and 4:3 (vertically 3:4). Below you’ll see how the 3:2 ratio creates a photo that is slightly longer and shorter than the 4:3 photo ratio. This can have a significant impact on the photo itself, which is obvious in the images below. With the 4:3 ratio, part of the bird’s beak is cropped away, changing the power of the image. Selecting the right ratio for you photo wall print is so important because crucial elements in your photo may be cropped to fit the ratio (as you see with the bird’s beak). Your camera shoots photos with a specific ratio. When you choose to print at a different ratio, then the original photo will need to be cropped either horizontally or vertically. This means that an important part of your photo may be lost. The ratio of your photo depends on your camera’s sensor. Often you can determine the right ratio for printing simply based on the type of camera you have. Full-frame and APS-C camera’s shoot in a 3:2 ratio while compact cameras shoot more often in a 4:3 ratio. Photos taken with a smartphone often have either a 4:3 or a 16:9 ratio. 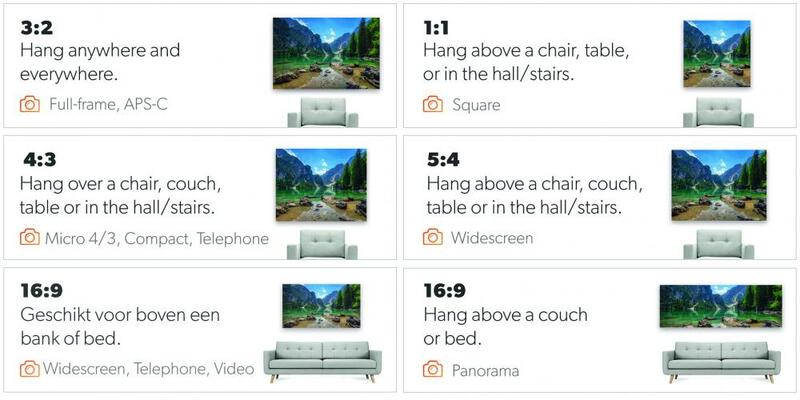 Here’s a table with the most common photo ratios by camera type and where each ratio will look great in your home. Useful!???? Test different ratios! Start with the most common ratios of 3:2, 4:3, 16:9 and 5:4. If the Crop frame captures almost your whole photo, you know you’ve found the right ratio! 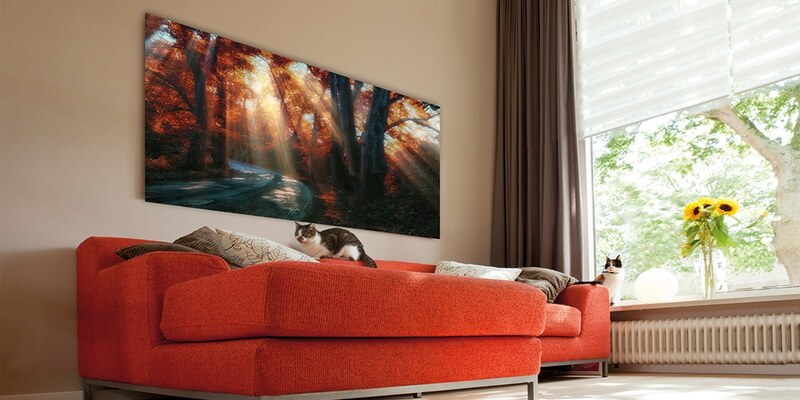 Prefer a square or panorama photo wall print? Cropping your photo to fit a different ratio is easy! For a square photo, crop your photo to fit a 1:1 ratio. For a panorama photo, crop your photo to one of these ratios: 2:1, 3:1, 4:1, 5:1, 6:1. 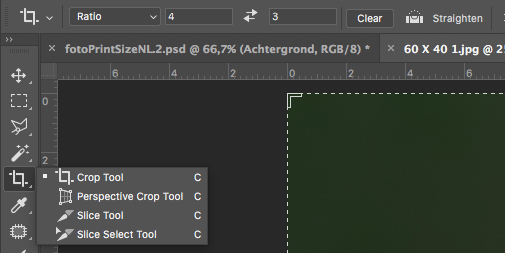 Use the Crop Tool to easily check your photo’s ratio. You can also calculate the ratio of your photo using the photo’s resolution. Easily find the resolution of your photo on a Window’s computer by right-clicking on the photo file and then scrolling down to Properties (on a Mac scroll down to “Get Info”). Under Details (“More Info” on a Mac) you’ll see the photo’s size in pixels. Check the article How to Check Your Photo’s Resolution Before Printing for a more detailed explanation. ???? To calculate the ratio of your photo start by dividing its width (in pixels) by its height (in pixels). If the total is not a whole number (also called an integer), multiply it by another number until it is. These two numbers (the number you used to multiply it and the final total) are the ratio of the photo. Is your photo ready for printing? Check out all the photo ratios and sizes available at Xpozer.com. With an Xpozer 4-Pack you’ll experience your photography as never before!